The Risknowlogy Safety Passport ID Card for Risknowlogy Safety Passport holders. Use it to proof your competency during safety meetings. Who can apply for a Risknowlogy Safety Passport ID Card? If you have a Risknowlogy Safety Passport then you qualify for a Risknowlogy Safety Passport ID Card. You automatically receive a Risknowlogy Safety Passport when you followed one of our training courses, if you have applied for certified competence or if you have applied for a Risknowlogy Safety passport by verifying your external Certificates and Trainings. 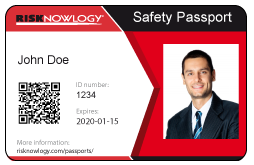 If you want to know more about the Risknowlogy Safety Passport ID Card, click HERE. Note: Shipping charges are included in the price.